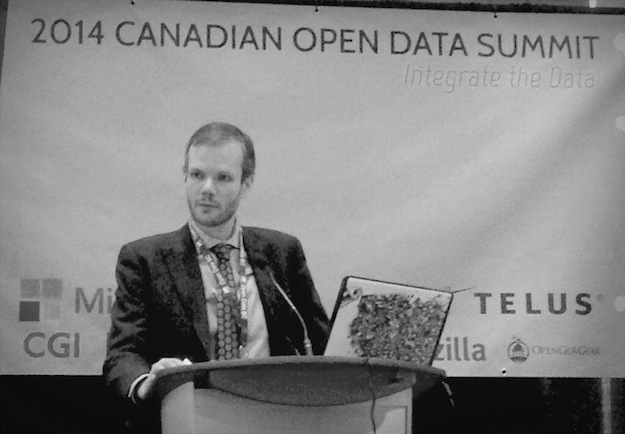 Last Friday, I had the privilege of speaking to the Open Data Summit in Vancouver about the political and cultural barriers to transparency and accountability in Canada — and what those barriers mean to the open data movement. That talk appeared to be well-received, with audience members describing it as “powerful,” “thought provoking” and “fascinating.” So I’m pleased to share the text of it below. This entry was posted in Democracy, Freedom of Information, Media, Public Opinion on February 25, 2014 by Sean Holman. Sixty-one years, eh? How about this: for the first time in eight-hundred years of Commonwealth parliamentary history a legislated tax was repealed by force of popular measure; I doubt you would be surprised that this precedent was set by British Columbia when its voters availed themselves of the province’s Citizens’ Initiative laws to successfully petition the government against its HST legislation (that is, they got at least 10% of voters in each of BC’s 85 ridings to sign the petition) which resulted in a Referendum at large, which in turn rejected the unpopular tax, compelling the government to repeal it. First time… 800 years… the entire Commonwealth… the greatest hegemony in the history of the world…in this case the government definitely didn’t get what it wanted—moreover, they were forced to undo what they had done. I must admit I’m somewhat surprised and disappointed BC voters don’t seem to recognize how big the HST Referendum really was and, now that we know it works (remember there had been some 28 Recalls under the same CI laws, all falling short of their thresholds—except, perhaps, the one when a BC Liberal MLA resigned rather than go down in the history books as the first to be recalled under the legislation— otherwise it looked like that particular Recall was headed for success), that there seems little enthusiasm to resort to this important democratic instrument. During this same fiasco another element related to access to government info arose when the so-called “Acting” Chief Electoral Officer (the previous, legitimately selected and longtime Chief and his Assistant had just been suddenly fired, replaced by a BC Liberal appointee– who could not demonstrate impartiality and who was not legitimately selected by an all-party committee– especially, it looked like, to handle the Citizens’ Initiative on the government’s behalf) refused to release the results of the Anti-HST Petition until forced to do so by court order. While I agree public business should be out in the open and that governments shouldn’t be adversaries in this regard, the other arms of government exist, after all, to check and balance legislative excesses—we’re simply not accustomed to resorting to them—in fact, we feel that we shouldn’t have to resort to them. In a country where half the electorate can’t even be bothered to vote, legislators rest assured that voters are much too lazy to resort to much more difficult avenues like courts, tribunals and Citizens’ Initiatives—except, of course, when a government gets too bold and hits a nerve, like Gordon Campbell did with the HST in BC. So maybe we also need better access to the courts, where governments are in the habit of one-upping us public plaintiffs with our own tax dollars whilst most of us individually cannot afford litigation; even in numbers permitted by class action, it’s still prohibitively expensive. Finally, while parliamentary members can get into trouble with the party that bankrolled their successful election campaigns for not thereafter towing the party line, they owe their seats to their constituents and nobody else. Maybe get booted from the party, but not from the House. Same goes for cabinet secrecy: as far as I’m aware, a member doesn’t break any law by divulging the goings on around the cabinet table, only the opprobrium of his partisan colleagues. In this case access to info depends upon personal integrity and responsibility to constituents.